WASHINGTON (CNS) — After the canonization of St. Oscar Romero finally came to fruition, Salvadorans and the saint’s admirers must give him new life by learning about him, pondering how his teachings apply to the present and helping others around the world based on his work toward ending injustice and exclusion, said the head of Pontifical Missions for El Salvador, the homeland of the newly minted saint. “We have to give life to his words, his teachings … a rejuvenation,” said Father Estefan Turcios Carpano, who spoke with Catholic News Service Dec. 27 during a brief visit to Washington. Much is said about his assassination, said Father Turcios, who was a seminarian living in exile in Ecuador when St. Romero, then Archbishop of San Salvador, was martyred while celebrating Mass March 24, 1980. And certainly, he was a symbol of a church under persecution, a Salvadoran who suffered injustices, calumnies, and ultimately a violent death like many of his fellow countrymen and women. “Now, we have a challenge … to transmit his tenderness, his closeness to the poor, the excluded,” said Father Turcios of the man he knew personally and whom he credits with saving his life after he was wrongfully imprisoned and tortured in El Salvador for six months in 1978. Then-Archbishop Romero secured his release and sent him to live with another bishop in Ecuador so he would be safe. This is not the time to remain in a celebratory moment, said Father Turcios, who also is the director of the Archdiocese of San Salvador’s office of human rights. El Salvador, as well as many nations around the world, still experience great injustices, said Father Turcios. Those injustices vary from place to place but believers can pray for St. Romero’s intercession and take action, speaking out the way he did, to end inequality and exclusion around the world. “The words of St. Romero are not just for Salvadorans. They’re universal and they were prophetic,” said Father Turcios. Though El Salvador today does not have the political-military conflict of St. Romero’s life and times, it experiences other types of injustices: lack of work with dignity, lack of safety because violent criminal gangs daily torment the citizenry, lack of potable water — both situations disproportionately affect the poor — and a massive displacement of people because of those situations, he said. But in El Salvador, the past often is difficult to put behind, he admits, partly because the injustices of the past were never resolved, apologized for and ultimately produced no justice or semblance of it. In the case of St. Romero’s assassination, no one has ever been prosecuted, and recently Father Turcios, through the human rights office, publicly denounced the country’s judicial system for “not carrying out justice” and said the only thing officials had produced in the 38 years since the killing were “creative” excuses. Aside from witnessing the canonization of his mentor, as well as predecessor (St. Romero was national director of the Pontifical Mission Societies of El Salvador from 1974 to 1978), what Father Turcios said he would like to see is a prosecution of those responsible for St. Romero’s death. 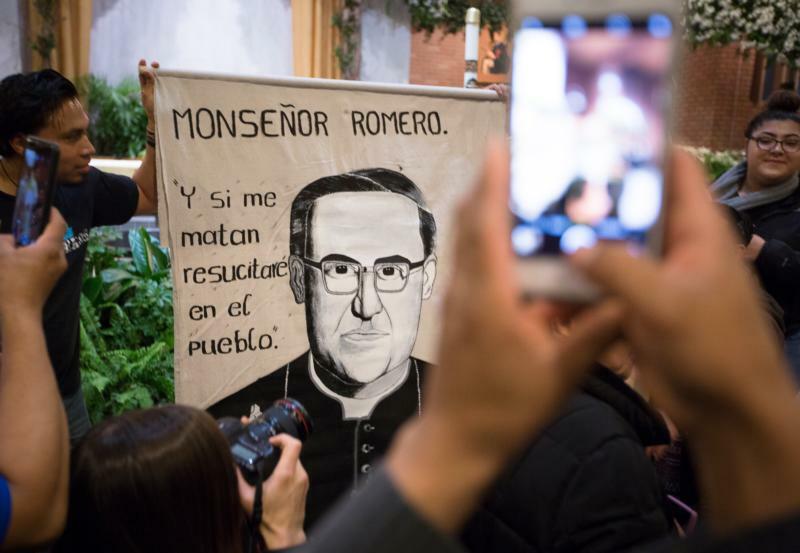 But Father Turcios said he looks for justice where he can find it and the canonization of St. Romero was “an enormous gift,” and a form of divine justice, one he didn’t think he would live to witness.